Jazzcamp 2011 was held at the Western Academy of Performing Arts (WAAPA) from July 11th-15h which saw a total of 56 aspiring young jazz musicians participate in this week-long series of masterclasses and workshops covering topics such as jazz improvisation, small and large ensemble playing, instrumental technique, rhythmic development, practice techniques and performance presentation. This years lunchtime concerts featured groups “The Hounds”, “Amanda Dee Quintet” and “James Sandon Quartet” and the camp was delivered by 8 tutors; Libby Hammer (vocals), Marty Pervan (trumpet), Troy Roberts (saxophone), Jordan Murray (trombone), Freddie Grigson (guitar), Pete Jeavons (bass), Russell Holmes (piano) and Daniel Susnjar (drums). In partnership with the Western Australian Music Industry Association (WAM), JAZZWA organised jazz workshops at St Hilda’s School for Girls (June 29th), Christchurch Grammar (June 28th) and Churchlands Senior High School (June 30th). Held at The Overflow Cafe (Northbridge) on Oct 29th this event featured a house rhythm section made up of highschool students (attendees of the 2011 JazzNOW Jazzcamp), led by an experienced jazz educator in a relaxed and informal setting. Designed to be a fun way for the Jazzcamp students (from various schools) to reconnect, and further their musical relationships and friendships whilst learning more about jazz and improvisation. The Jazzaziz Volume 6 CD launch was held at The Bakery as part of the 2011 WAMi festival and featured live performances from Alice Humphries 10 piece ensemble ‘Ecila’ as well as ‘Backlash’, ‘Libby Hammer’ and ‘ThumpR’. A pilot series presented at the Wardle Room (Perth Concert Hall) in partnership with the Western Australian Symphony Orchestra (WASO) and The Perth Concert Hall (PCH), the series segued the WASO Contempo concerts. Artists presented for this series were: ‘Allira Wilson Quintet’ (July 29), ‘Victoria Newton Quintet’ (July 30th), ‘Chris Sealey Collective’ (Nov 11), ‘Backlash’ (Nov 13). Showcase Jam sessions were held at The Ellington Jazz Club on Feb 20th and Nov 27th. Showcase Jam Sessions are designed primarily for visiting and local professional jazz musicians, as well as semi-professional musicians and jazz students. Community Jam Sessions were held on Saturday afternoons at The Overflow Cafe. Designed to provide performance experience and skills development for mature age aspiring jazz musicians, JAZZWA provided a WAAPA jazz student rhythm section led by an established Jazz musician/educator; March 26th (Russell Holmes), May 7th (Roger Garrood), June 18th (Ray Walker), Aug 20th (Garry Lee), Sep 24th (Russell Holmes), Nov 5th (Ray Walker), Dec 3rd (Russell Holmes). Cross project jazz jam sessions were held on Oct 29th at The Overflow Cafe (Youth Jam Session for JazzNOW! as above) and May 16th at The UWA Tavern (UWA Jazz Club). JAZZWA presented the ‘Backlash Jazz Quintet’ for a weekend mini-tour of WA’s southwest on June 24th-25th. Friday June 24th consisted of a workshop at Australind Senior Highschool followed by a performance that evening in the school Performing Arts Theatre. Saturday June 25th saw the group perform at the Bunbury Regional Performing Arts Centre as part of the Bunbury Performing Arts Eisteddfod. ‘Backlash’ also performed in Perth at The Ellington Jazz Club on Thursday June 23rd as a precursor to the regional dates. Robin Murray was the inaugural winner of the Young Composers Prize. 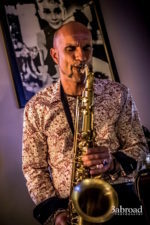 His work “Charlie (Haden) and the Great (Philip) Glass Elevator” was recorded/produced by Pete Jeavons for JAZZWA (performed by WAYJO) and released on the Jazzaziz volume 6 compilation CD. The prize included mentoring with WAYJO’s Musical Director Mace Francis. In 2010 JAZZWA commissioned Tom O’Halloran and Graham Wood to each write a new work for piano duet; ‘Dissolve’ (O’Halloran) and ‘Cohesion’ (Wood). These two original works (along with a couple of jazz standards) were recorded at the Perth Concert Hall on Thursday March 31st (2011) using the Perth Concert Hall’s finest Steinway pianos. This was quite possibly the first time that two top WA Jazz pianists have composed and recorded together in the piano duet format. The Piano Perspectives CD (featuring the 2 original works and 2 jazz standards) was launched at The Government House Ballroom on Sunday Dec 4th in partnership with Friends of Government House Ballroom and Zenith Music with affiliate organisations; Perth Jazz Society, Jazz Fremantle, Friends of WAAPA, The Ellington Jazz Club, Friends of WAYJO, WAM and UWA Jazz Club. Facilitated and supported by JAZZWA, The University of Western Australia Jazz Club (UWAJC) was established in 2011 to organise and promote jazz-related activities (including performances, jam sessions, listening sessions, workshops and masterclasses) at UWA. The UWAJC aims to raise the profile of jazz on campus and provide a platform for both students and professional jazz artists and groups to perform there.